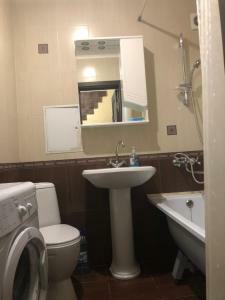 A-HOTEL.com - Luxury and cheap accommodation in Ayutinskiy, Russia. 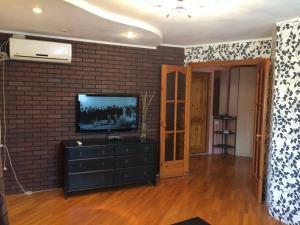 Prices and hotel, apartment booking in Ayutinskiy and surrounding. This indicative offer was derived from the most recently booked accommodation in Ayutinskiy and sort by the price, from cheapest Ayutinskiy accommodation to the most expensive hotels. To select accommodation by your preferences we recommend to choose from 1 accommodation offers in Ayutinskiy in total. By entering the dates of your overnight stay in Ayutinskiy and using the filter tools you can sort the best possible accommodation for you. The entered dates of your stay are crucial for the most accurate offer as it derives all the online information on pricing and availability of Ayutinskiy accommodation. Then you can book the selected Ayutinskiy lodging (hotels, apartments etc.) immediately. Set in Shakhty, Апартаменты на Чернокозова provides accommodation with a balcony and free WiFi. Guests staying at this apartment have access to a fully equipped kitchen. Apartment on prospekt Chernokozova 99B is located in Shakhty. This apartment also features free WiFi. 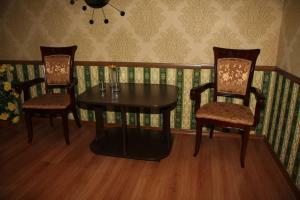 Situated in Shakhty, Nikopol Hotel offers free WiFi and a 24-hour front desk. The centre of the town is a 10-minute walk away. Set in Shakhty, Apartment on ulitsa Mayakovskogo 94 features air-conditioned accommodation with a balcony and free WiFi. The property features mountain views. Hotel on Lenina provides free WiFi and rooms with air conditioning in Shakhty. The units in the hotel are fitted with a kettle. Apartment on Sovetskaya 150 is situated in Shakhty. This property offers access to free WiFi. This hotel is located in Shakhty city centre, 200 metres from the Culture and Leisure Park. Hotel Chalet offers elegant, historic-style interiors with free Wi-Fi as well as free on-site parking. Located in Shakhty, Apartments Pobeda Revolyucii, 128 offers accommodation with a balcony. Free WiFi is provided. Gorniak 23 is set in Shakhty. Guests may enjoy free WiFi.